Now you’ve received your Instant Pot, taken it out of the box, and have even done the Instant Pot Water Test. But, still a bit leery and intimidated by the Instant Pot. It’s like learning to drive a car for the very first time. 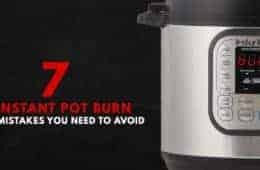 We gathered 10 Most Common Mistakes made by New Instant Pot Users & ways to avoid these mistakes below. *You can click on the links below to jump to a certain point. Mistake: It can be chaotic in the kitchen. We’ve heard many stories of users accidentally pouring ingredients into the Instant Pot housing without the Inner Pot. This happens more frequently than we all imagined. It almost happened to us once. Mistake: Many new users fill their Instant Pot with food & liquid up to the Max Line (sometimes even a stretch over the Max Line). This may risk clogging the Venting Knob. Solution: Be mindful that the Max Line printed on Instant Pot’s Inner Pot is not intended for Pressure Cooking. If you accidentally overfilled the pot, don’t panic. Just make sure to use Natural Pressure Release to stay safe and clean. Have you seen pictures of applesauce splattered all over the Instant Pot through the Venting Knob? Mistake: Many new users are unsure when to use Quick Pressure Release and Natural Pressure Release. There’s a chance of splattering if users use Quick Release when cooking foamy food, such as grains or beans. Solution #1: Use Natural Release for foamy food or when the pot is overfilled. But wait…most pasta recipes call for Quick Release, what should we do? Solution #2: Release the pressure gradually. You don’t have to turn the Venting Knob all the way to Venting Position to release pressure. The initial release is usually the strongest. So, release the pressure gradually by turning the venting knob just a little with your hand or wooden spoon until you hear a hissing sound. Hold it at that position to release the pressure gradually. We prefer wearing silicone glove and use our hand for more control. Mistake: Some new users have mistaken the “Timer” button for setting the cooking time, then wondered why the Instant Pot is just sitting there not doing anything. The “Timer” button is actually for delayed cooking. Mistake: It might be a bit overwhelming to use the Instant Pot in the beginning, and it’s common to forget to turn the Venting Knob to the Sealing Position when cooking. Solution: Make it a habit to turn the Venting Knob to Sealing Position every time you start pressure cooking. Don’t walk away until you made sure the Floating Valve has popped up. Mistake: Due to convenience or limited counter space, some users like to place their Instant Pot on the stovetop. Sometimes, things happen…and we see melted burnt Instant Pot bottom. Sorry, we don’t have a picture to show you the aftermath, but we see this happen frequently. Solution: Please don’t put the Instant Pot directly on the stovetop. Some users lay a wooden board between the stovetop and Instant Pot to prevent this disaster. Or, you can get this cart from IKEA, as it fits the Instant Pot perfectly. Mistake: As a new user, it’s not intuitive on how much cooking liquid to use. If there’s not enough cooking liquid or the liquid is too thick, Instant Pot will not be able to generate enough steam to get up to pressure. We recommend new users to use 1 cup of total liquid until they get comfortable with the machine. Always add thickener such as cornstarch, flour, arrowroot, or potato starch after the pressure cooking cycle. Mistake: On the contrary, when there is too much cooking liquid in the Instant Pot, it will increase the overall cooking time (both time to get up to pressure & Natural Release time). This may overcook the food. Plus, too much cooking liquid will dilute the seasoning, resulting in a bland dish. Solution: Unless stated in a recipe, we recommend new users to use 1 cup of total liquid until they get comfortable with the machine. Mistake: Since the silicone sealing ring absorbs the food smell, many users regularly air out/wash the sealing ring. It’s easy to forget to place it back into the lid before using the Instant Pot. If the sealing ring is not properly installed, steam will come out around the edge of the lid and the Instant Pot will not get up to pressure. Solution: Make it a habit to ensure the sealing ring is properly installed every time, before you close the lid for pressure cooking. 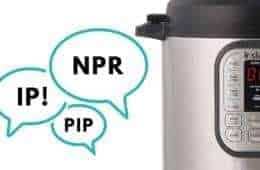 Mistake: We’ve heard some new Instant Pot users have less than satisfactory results with their rice cooked in the Instant Pot using the “Rice” Button. Solution: Different types of rice require different water to rice ratios & cooking times. For best results, we like to use the “Manual” Button for most control on Cooking Method & Time. Mistake: Some users ran into a problem that all their Instant Pot meals were undercooked. We later found that they always start cooking by pouring hot water into the Instant Pot. 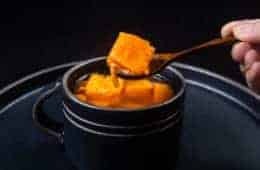 Using hot liquid in a recipe that calls for a cold liquid shortens the overall cooking time, because Instant Pot will take a shorter time to come up to pressure. Since the food starts to cook when Instant Pot is heating up & going up to pressure, and this part of the cooking time is shortened, the food may come out undercooked. Solution: Use cold liquid to cook or adjust the cooking time stated in the recipe accordingly. Bonus: Think that 1 Instant Pot is Enough! Be Safe & Have fun cooking with your Instant Pot! OK – I did #! this morning. Your response isn’t helpful. How do I clean out the Instant Pot? You will want to dry the Instant Pot and air dry it completely for roughly 48 hours before turning it on. My IP doesn’t go from sealing to venting on its own. After the meal is cooked i have to release the valve to venting. How long should i wait to go into venting (waited 30 min) or whats wrong, its not releasing the pressure on its own? The Instant Pot will not go from sealing to venting on it’s own (Except the Max version). It will depend on the recipe. For example, if our recipe say to natural release for 20 minutes, then wait 20 minutes before turning it to the venting position. 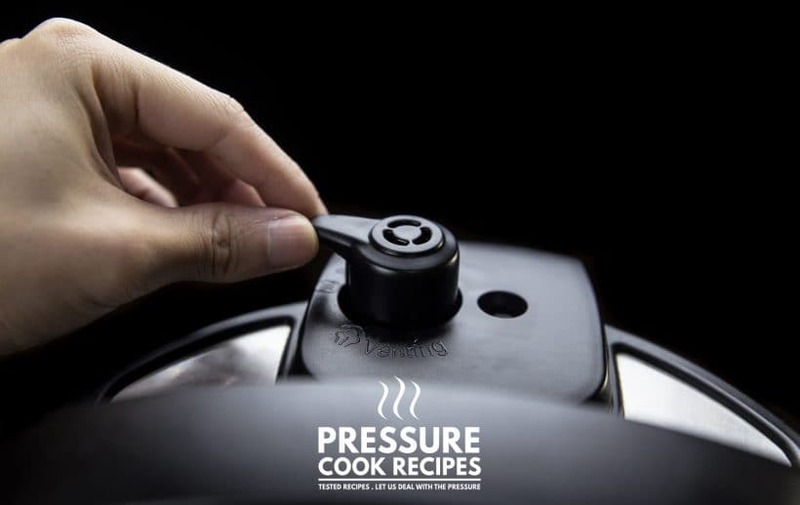 If the recipe says quick release, it means to turn the venting knob to the venting position right after the pressure cooking cycle has finished. 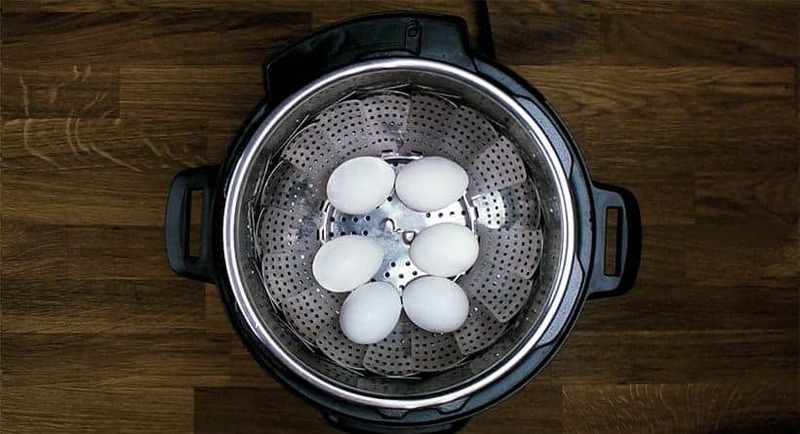 I would like to hard boil 14 eggs at one time since I bought that special basket. How much water do I need to put in my Instant Pot, and how long should I cook them? I did 2 eggs and 1 cup of water and the water evaporated, but the eggs were delicious and easy to peel. If the water was evaporated, it means the Instant Pot was not sealed properly. Please make sure the silicone ring is seated properly and the venting knob is turned to sealing. 1) Make sure the sealing ring is installed properly. 2) Make sure the venting knob is on the sealing position. Where can I get an instant pot manual? My instant pot pressure release knob is very wobbly and I’m not sure if that is normal. Thank you for your question. The release knob is supposed to be wobbly. You can find the Instant Pot manual online on Instant Pot website. Congrats on your new Instant Pot and thank you for your question. Here is our chicken and dumplings recipe. Thank you for your question. It will be best to take a picture and send it to the Instant Pot customer service team. I’m a newbie as well. I made a pork tenderloin and it said to let it release naturally. The pressure knob didn’t go down and it didn’t naturally release. What did I do wrong? Thank you for your question. The natural release should take place in 10 – 15 minutes. I am a newbie. I have used my instant pot about 4 times now. My pressure knob has never risen up. It stays down all the time while I am pressure cooking. What am I doing wrong? 1) Make sure there is at least 1 cup of liquid in the Instant Pot. 2) Make sure the sealing ring is installed properly. 3) Make sure the venting knob is turned to the sealing position. Thank you for your question. It sounds like the liquid was too thick. You will want layer the thicker ingredients on top and avoid mixing them in. I just got a Cosori Pressure Cooker for Christmas. I can still follow along with these instructions and recipes correct? If so, this website has given me a lot of insight! 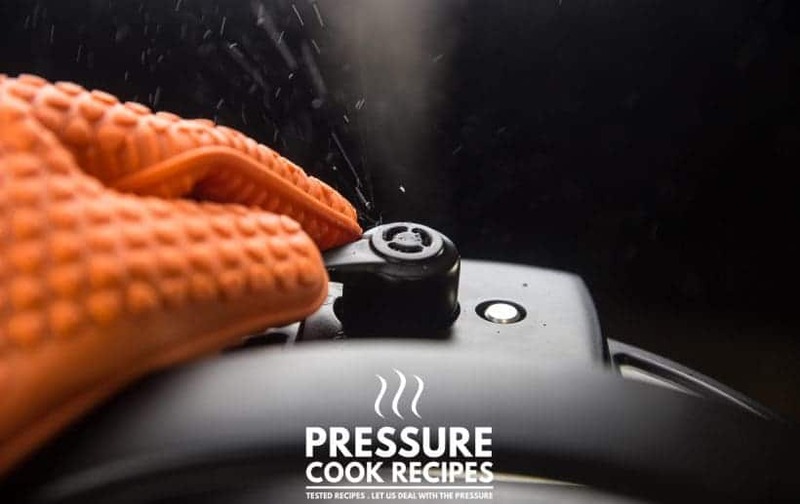 Our recipes will work fine for Cosori Pressure cooker! I tried to use my Instant Pot to make meatloaf, and I know I did something wrong…kept getting a burn signal. Am I supposed to add water when making a meatloaf? This was my first try at it, so I’m not sure how I’m supposed to do this. Any help would be appreciated. Yes you will need some sort of liquid at the bottom. Please use this recipe as reference. Thanks so much Jacky…I appreciate the help! I just purchased the ultra mini. I attempted to cook one pear with the pressure cook function. I added one cup of water. The cooker automatically set to 35 min. It normally takes me 18 min to cook on the stove. I only added one cup of water. Never cooked on pressure. Do I need to add more water? It will probably take roughly 8 – 10 minutes to cook it in the pressure cooker. You can use the pressure cook button and adjust the cooking time using the + and – button. Thank you great tips!! I am a newbie I just made some loaded potato soup and use the quick release. Which caused the cream from the soup to release all over my kitchen cabinets. Soup was delicious but a mess was made. I will remember to use the natural release or slower next time. Thank you again!! You will master the Instant Pot in no time! Hi guys newbie question, just got the 8 quart made chilli it was my usual recipe in the instant pot, I can of tomatoes and beef broth too. When I set it to chilli and put it to the suggested time of 20 minutes I could not tell if it was timing backwards? It was steaming though not crazy then I got the burn message. I waited a minute or 2 as it happened quickly and hit cancel. I opened it context were hot and it did not burn to the pot. Started again and still no read on remaining time?? What am I doing wrong? TY!!!! The timing will only appear once the Instant Pot has sealed and gotten up to pressure. From your description, it sounds like the Instant Pot was still trying to build up pressure. I had the same problem last night with my new 6qt DUO. It was going for about 20 minutes, then when I went over, the timer was at 19, I thought it was counting up (which is unusual), but it was counting down. I stopped it, released the steam, and my chili was at a roiling boil and done perfectly. I figured that if it had gone another 20 minutes it would have been mush, so I stopped it right there and ate dinner. I used the Chili/Beans setting. Is this normal operation of it? 40-50 minutes to make a pot of chili makes it not the best use of this tool. Thanks! We recommend using 10 minutes pressure cooking time for chili with the manual/pressure cook button. Love all your recipes and tips, but I have two comments. One, you say that one cup of liquid is enough for most recipes even an 8 quart pot. The Ultra specifically says to use At least 2 cups of liquid. Are you saying that is not necessary even though the manufacturer says it is? 2, you say to use an oven safe pyrex dish in the pot. Pyrex and CorningWare both specifically state that their products are not tested to be pressure cooker safe. I know many people use them. But I think it’s irresponsible to recommend that against manufacturers’ advice without at least putting a warning. I very much appreciate all the hard work you put into testing in developing these great recipes. 1) One cup of liquid will work fine even in an 8 quart pot. In the old Instant Pot 6 qt manual, the manufacturer says it needs 2 cups of liquid. In the newer manual, it has been revised to 1.5 cup of liquid. 2) Thank you for letting us know about the Pyrex and CorningWare. I will send them an email regarding this issue. I bought an instant pot last week and it’s still in the garage. Thank you for your thoughtful and very helpful tips. I remember 30+ years ago when my Mother gave me a pressure cooker – i opened it up began to read the instructions and the cautionary statements on steam freajed me out and it took me three years before I started to use it. I made fabulous meals and the best beets ever! Now I’m facing a similar experience with the Instant Pot. I know it’s going to be a great tool and companion in the kitchen. I’m 68, retired Nd have all the time in the world to cook – I’m just getting tired of it. This will help when grandchildren come over we’ll have more play time. Thank you! I am sure you will be able to make fabulous meals in the Instant Pot in no time! I can totally relate, Phyllis. I got an instant Pot for my birthday a month ago. The first time I used it, when it came time to release pressure, I was leery, to put it mildly. I used an oven mitt and 18″ bbq tongs to turn the knob. Even then I jumped at the initial blast of steam. My hubby said it was quite a sight! 😄 I have learned since that there’s nothing to be skeered of, but do always use some kind of hand protection when you release the pressure. You will love cooking with it! I tried to make my regular stove top spaghetti sauce in my instant pot. I wanted to see how it turned out under pressure. I am use to an old fashion pressure cooker. The problem I had was I wanted to set it on Pressure Cook mode and put in a time to remain in that mode and I could not figure out how. Can you give me the steps (buttons to push) to do this? I was thinking about 30 minutes under pressure would equal 3-4 hours on stove. I have a ‘7 in 1’, 6 quart instant pot and I have to say I love it. I will also say that I’m not very adventurous and tend to stick with the a few incredible recipes I have mastered. I want to Branch out, are there any specific websites or recipes you would recommend? As for the burning message, here is an article on how to avoid it. My wife melted the bottom of the lid. I was able to cut off the plastic that caused the lid to not go back on but it melted so bad that a magnet fell out of the lid close to the pressure button. The sealing ring is undamaged. I briefly tested it and brought it up to pressure and it appears to still work fine but I am worried that it has damaged a safety feature that will turn it into a bomb and over pressurize. Do I still have safety features? thank you for your comment and question. I am sorry to hear what happened. I think it is best to send a photo to the Instant Pot customer service team and see what they say. Hello! I’ve had a 6 qt for a year and have enjoyed it so much that I recently got an 8 qt. How does your advice re: 1 cup of liquid apply to an 8 qt? I’ve read that I should use 2.5 to 3 cups of liquid, but that seems like a lot. Any thoughts?? 1 cup will be enough liquid for the 8 quart. To be sure, you can do a water test with 1 cup of water and see if it can get up to pressure + maintain the pressure. I was glad to find this article before using my new instapot for the first time. The Teflon has worn off some underneath the cooking pot. Is the unit still usable? What brand is your pressure cooker? Can you take a picture of the worn off bottom? What happens when the sealing ring is on, but a part of it is a little lop sided. The food finished via the alarm, but when you move the knob no steam comes out, you open the lid, and its steaming, sizzling inside, the food looks, cooked, all the water is gone, its hot inside, but the seal was a little off hence no steam coming out when you push the knob to release pressure, and all the water is gone inside? cook an additional 10 minutes to be safe with the sealing ring put on correctly? thank you for your question. Sounds like the water evaporated due to steam leaking from the Instant Pot. It will depend what you are cooking, the food can be fully cooked in that timeframe. I have a 8 quart instant pot. Most recipes are for the 6 quart. When making recipes do you need to add more liquid? When making some of the recipes the “burn error ” came on. I believe I had enough liquid in the pot. Any suggestions? For most of the recipes, you will not need to use more liquid. Can you show me an example of the recipes you are getting the burn error. 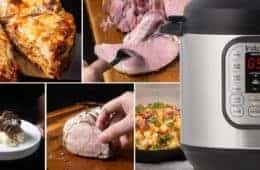 I have been cooking some great meals with the Instapot and now want to fry some chicken. Can I do this? Plan on about half cup of oil, a bit of water and saute funcion. Water and oil don’t go well together. I would recommend using only oil and shallow frying on a skillet instead as the Instant Pot is not designed for proper frying. I have the thinkkitchen multi-function pressure cooker. I bought it over two months ago and have not used it yet. I am not sure how to. Their instructions are very vague. I am vegan so I would mostly use it for rice and beans. We don’t have too many vegan recipes, but this page should be useful! Hi, I got the pressure cooker for Christmas & I’ve just started using it. I made stew yesterday and it tasted good the meat was tough, what did I do wrong? It sounds like the meat was overcooked or not cooked enough. We are here so please do let us know if you come across any questions! I have the 7 in 1 Instant Pot and so many recipes mention the Manual button. Mine doesn’t have one. Which do I use? So far I’m kind of sorry I didn’t just get a regular Pressure Cooker as instructions with it are poor and not user friendly and I consider myself fairly tech savvy. Any advice is greatly appreciated. 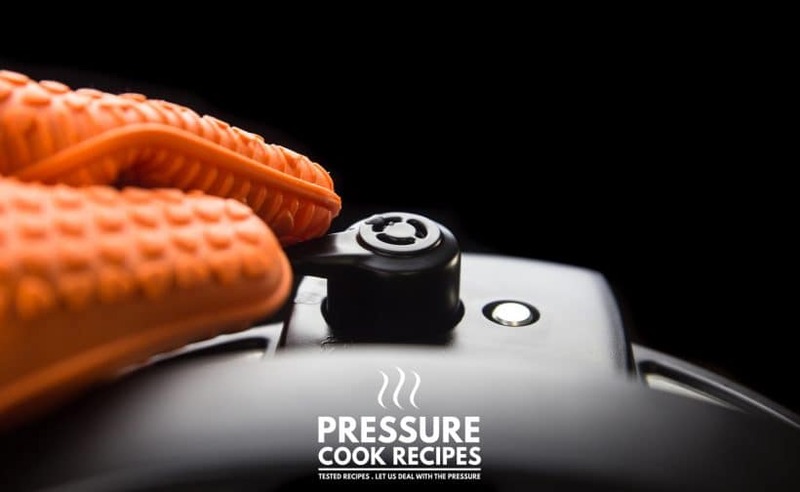 The newer versions have renamed the Manual button with Pressure Cook button. I seem to have the problem of things sticking to the bottom of the pot. No matter which liquid I use, or how much is in the recipe.Meat,vegetables,rice everything sticks while it cooks. Nothing sticks while I’m sauteing onions or browning meats. What am I doing wrong? Make sure to deglaze the pan after sauteing. If the ingredients are still sticking, then it means steam is leaking somewhere. I didn’t put lid on securely and sauce leaked under heating element scorching,duh does the heating element assembly separate from the main unit to clean under the element? Help! Stumbled on to your site WOW,glad I did GREAT! The heating element can be separated from the main unit. I think the screws are at the bottom. I would recommend contacting the Instant Pot company and see what they say first. 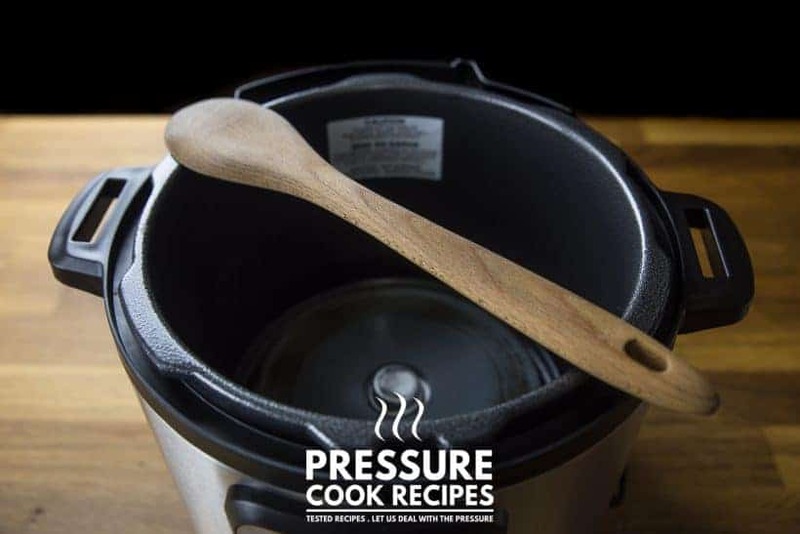 Some recipes ask for initial pressure cooking, then quick release the pressure, add veggies for example, reseal and presser cook for 10-15 minutes extra. When I tried that, it would ONLY allow me to set time for 4 min, if it would get reset back to ZERO if you tried to go over 4 min. Am I doing something wrong? or I cant get past teh 4 min 2nd time around? it should be able to set the time for more than 4 minutes. I am thinking you maybe setting the time to 4 hours if it says 4:00. Thanks for this post, definitely helped. I am quite skilled with the old 1960 pressure cooker I inherited from my Mom, but it always terrified my Wife and the kids, so at her urging got one of these things. My first two attempts using it have turned out OK, but not great.Maybe worth noting, I am totally cool with new tech, it’s kind of my job, but both times cooking with it thus far have just been super stressful. Recipes will say to use saute or pressure cook, but say nothing about use ‘low’ or ‘high’ pressure, or when supposed to saute, should I use low/med/high, stuff like that. And these first 2 were recipes out of the book that came with it and still lacked such important details. Are there any general guidelines as far as interpreting recipes as a beginner? Thanks in advance. I think this article will be a good read! We are new to pressure cooking. After reading instructions, we did the water test and it passed. My husband made a delicious vegetarian chili last night. I was going to boil eggs today, and when I poured the cup of water in, it came right out the bottom. Help! The inner pot will have to be in the Instant Pot before cooking or adding any ingredients. You will need to dry the bottom as much as you can and let the bottom air dry completely. Do not turn it on before it dries completely (Give it a day or two just to be safe) as it can cause short circuits. I just got my Instant pot ultra 60 and did they water test last night with no problem, today I plugged it in and nothing will turn on. All Black! Cannot get it to do anything. Please help. Make sure the connector is plugged into the Instant Pot fully. Hope this will fix it! Hi I just got my instant pot duo plus 60! I never have used a pressure cooker in my life! I did the water test and all went well, then I put a sirloin steak about 3/4 in think seasoned with salt and pepper added can of diced tomatoes and sliced mushrooms I added about 3/4 cup beef broth. I turned the valve to sealing and pushed the meat/stew and set time to 35 mins then did quick release. everything was perfect. Now being a newbie I assumed I pressure cook it all, tonight I put it on sauté and cook chopped onions and browned ground beef, added a little oil will cooking onions and meet, then added seasonings and tomatoes and tomato sauce 1/2 cup water two cans of pintos with their juice and left steam to venting hit the chili/beans button 30 mins came on screen then on I set another time to check it out. At then end of 30 mins the screen said 28 mins! Now was that for keep warm (which was on ) or was it still cooking? I canceled it at that time and pushed steam to release faster then found something had lightly stuck on bottom of inner pot, I think it was grease from the oil I added to cook onions and meat . Now did I do it right with my chilli? Or should I have closed the vent to cook it? The venting knob should have been turned to the sealing position for pressure cooking. Here is our Chili recipe as a reference. There is a cooking video on the page. If you are a visual learner, it will be helpful! I’m a novice Instant Pot user and my rookie mistake was making yogurt after chicken curry. I cleaned the interior of the pot very well, but didn’t clean the sealing ring. I’m not sure what I’m going to do with a beautifully set gallon of curry smelling yogurt! Live and learn. Live and Learn is the way!! Instant Pot has released a set of Sweet & Savory sealing ring. The set maybe useful to you. Happy New Year & Have a great week ahead! We are using the Power Pressure Cooker XL, the directions are very poor, which did not tell us to remove the steamer tray. Duh. It took us a good hour to figure this out. Just bought the Lux 3L mini. Very happy with the results of four days of straight cooking (using your recipes!!). The mac and cheese was absolutely the best I have ever tasted, the BBQ ribs superb, the rice moist (and better than any time I ever cooked it in our rice maker). Finally the pot roast with the shredded carrots… two thumbs up!! What will I cook today…mmmmm ;). Thanks so much for your recipes and taking the guess work out of using the instant pot. I am new to pressure cooking and definitely was a little intimidated by the thought of the stream coming out of the vent. I’m sure there will be lots more delicious meals to come. Wish you & your loved ones a Merry Christmas & Blessed New Year! We have done some bean experiments on this recipe! I’ve made several of your recipes. I would like to see more. This post was very helpful, thanks. I just bought a Mini Instant Pot (3 qt) and haven’t even unwrapped it yet…doing research first to make sure this was the right purchase for me. I usually only cook for one, so a big IP seemed too large. Since most recipes seem to be written for the 6qt, is it safe to just cut a recipe in half? Would I use a 1/2 cup of water instead of 1 cup? Only cut the solid ingredients in half if you are halving a recipe. The liquid ingredients and cooking time will remain the same. Most of the recipes can work in the 3qt without any adjustment. If the solid ingredients can be fit in the 3qt without overfilling, everything will stay the same. Do you also have an instant pot cookbook in print? I’d love to request my husband get it for me for Christmas. Blessings! So I’m a newbie and I did mistake number 1 I poured dry rice in the cooker without the liner. I managed to dump most of it out but I can still hear so rattling around under the heating element. Is there an easy way to get the rice out or can it be left there without risk of starting a fire or the likes? I would try to get all the rice out just to be safe. 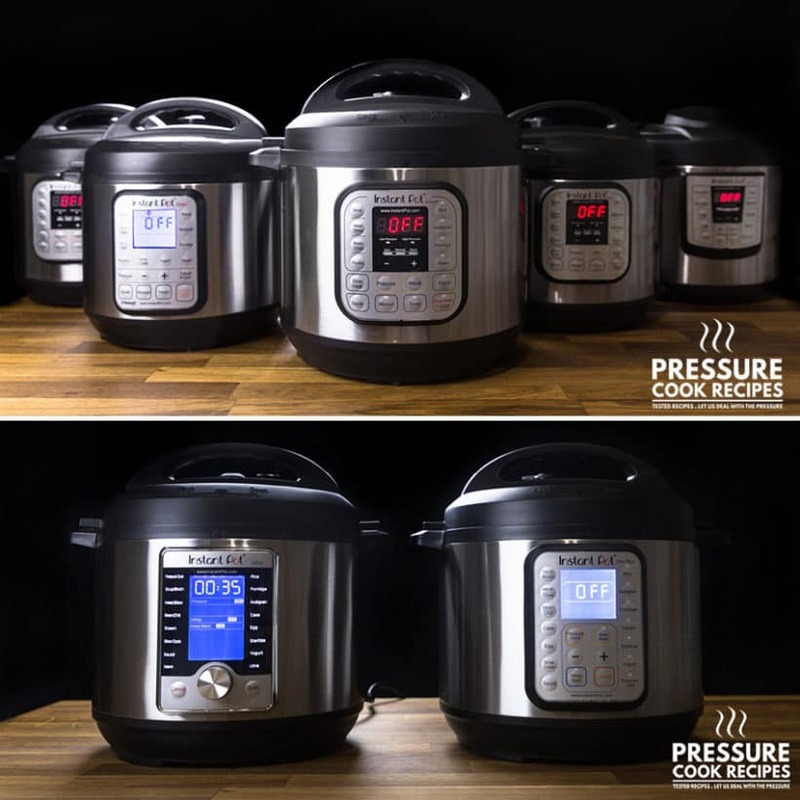 Contact the Instant Pot support here and see what they can do. Thanks for the Black Friday heads up! Would you know if I can use the 6-quart IP liner in the 8-quart IP? Just found out I haven’t answered this question! The 6 quart IP liner cannot be used in the 8 quart IP. Do not leave instant pot on stovetop, even if on a board, etc. Mine has been on stovetop but l did not notice that when l used my oven/broiler, the heat has been melting the control panel on the IP. The knob won’t turn easily and although it seems like it might work in that l can push buttons and get times, l don’t want to risk it. So l’m taking pieces off (seal, cord, liner) and keeping those to use with a new one soon to be ordered. I would keep the lid but am afraid the seal may be damaged too. Better safe than sorry. Anyway, I just had to mention this so someone else doesn’t do what I did. The Instant Pot will go on sale on Black Friday! There are few times that my instant pot don’t build any pressure when I’m making a stew, even if i press the High Pressure – when i thought its done after 45 min, the meat is still hard….what have i done wrong? It sounds like the liquid was too thick to generate enough steam for the Instant Pot to get up to pressure. You will need to dilute the liquid with some chicken stock or water. Make sure no steam is leaking around the lid and the venting knob is on sealing position. My Instant Pot didn’t seal properly. The button raised to the stop, but I could tell it didn’t pressurize correctly. It didn’t beep when it was done either. what do I do? Was any steam leaking out? Check to see if the silicone ring is seated properly and do a water test. I put water in my instant pot without the liner will this ruin my pot? Is there any way of correcting this? It should be fine, but you must let it dry completely first. Do not try to turn it on until it is completely dry as it can fry the circuit board. I’m one of those people who left it on the stove and my husband turned it on (the stove) while cleaning but. He caught it but not before some of the plastic on the bottom of the pot melted. The wires are all still covered and protected but the plastic definitely warped. Is the pot still useable or do we need a new one. thank you for your question and sorry to what happened to your pot. 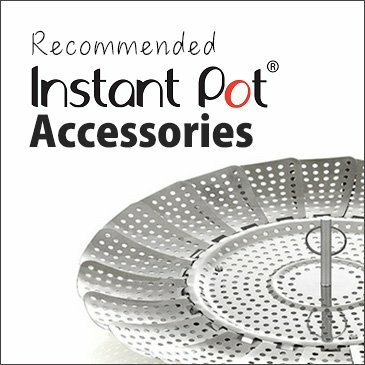 I would recommend taking a few pictures and contact the instant Pot support directly over their website. Take care & have a wonderful weekend! I’m wondering if you can use the plastic crock pot liners if using the pressure cooker! The pressure cooker operates at a much higher temperature than a slow cooker so I would not recommend it. I’ve seen recipes that say no liquid. I assume there’s enough moisture or juice in the other ingredients but am too scared to try it. Are there situations where you don’t have to add any liquid and it won’t break your IP? Rarely will a recipe contains no liquid unless the meat is filled with juice. The only one I saw was a whole chicken recipe and sometimes it can fail if the chicken does not have enough moisture in it. September 27, 2017 Kate R.
I regularly make a breakfast casserole in my pressure cooker. I put grated potatoes, cooked sausage or cooked bacon, uncooked scrambled eggs with a little milk mixed in, and top with cheese. One rice cycle (6 minutes in my Fagor Multi Cooker) under pressure and its done and yummy. I’ve done this for 12+ years with no harm to my pressure cooker. We hope to publish a review on the Ultra soon! I would love to do a caka but no spring form pan,any suggestions? Love all the info. or you can purchase this super popular fat daddio push pan. You may put it upside down and give it a few shake to see if you can remove all the grains first. If some of the grains are still stuck, you may have to remove the bottom part carefully with a screw driver. Amy & Jacky, this is awesome. Thank you thank you thank you! Hiii, thank you for the site. I was be my 4 time cooking in my Instant POt and it doesn´t heat. The panel is ok, the pot closed, make the 3 beeps, panel ON and… nothing happen. I´ve already checked everything and can not understand what is wrong. You may want to check the connection between the plug and the pot. I have bought the Instant Pot and used it many times. Afterwards, we also bought two liveParrots and were told that we can NOT use Teflon ANYWHERE near the birds ! The inside pot is stainless steel, but is the base (Housing) pot coated with Teflon. It looks non-stick, and I need to know as the fumes from Teflon is poisonous to birds. I think it is not coated with Teflon, but just to be safe, please contact the customer service from Instant Pot to make sure. 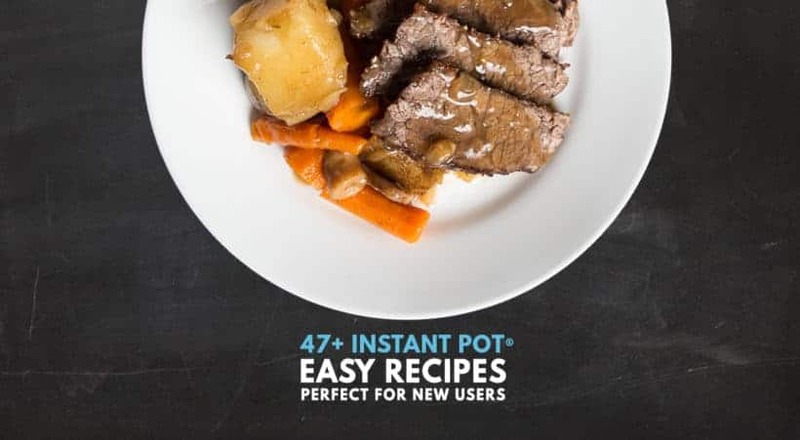 Hi, I have the instant pot and used it several times and it worked good. But the last two times, the pressure didn’t show up and my food stuck and burn some on the bottom of the pan. What did I do wrong. It is a 6 qt GoWise instant pot. It could be the result of a few things. I used my cooker for the first time. Made beef stew meat with brown gravy. When I released the valve, the gravy liquid sprayed threw the valve and sprayed everywhere making a scarey mess. I can not get the valve off to clean it. What did I do wrong and how and how do I clean it? Was there a lot of liquid in the pressure cooker? Generally 1 cup of liquid will work great. Another solution is to use the natural release instead of the quick release. Rinsing the lid under tap water should clean the valve. Thanks for your answer about the Calrose rice. I’ll use that formula for my pot in pot rice dishes. If I just use it for the rice and put in 2 cups of each would I double the time (12-minutes instead of 6). And how about for 2½ cups of Calrose and water. That last bit gives me more rice than my rice cooker will make, which means I can make more sushi! I usually use Calrose rice because it’s the same rice I use for sushi and that’s about all I have in the kitchen. I normally would cook it in a rice cooker but would like to use the Instant Pot instead. I made one batch and it turned out a bit underdone. Used equal amount of water and rice but don’t think I had it in long enough. It was either 6 or 7 minutes. I made a Mongolian Beef dish and did the pot in pot rice, but the rice was a bit mushy because the Mongolian Beef recipe called for 12-minutes at pressure. Still tasted fine but consistency was off a bit. Any suggestions for optimum time for Calrose rice? We tried using Calrose rice with great result in our Teriyaki Chicken pot in pot recipe. We did 1 cup water (250ml) & 1 cup (230 g) medium grain Calrose rice for 6 minutes + Natural release. Just got my pressure cooker and followed recipe for roast beef with vegetables. The veggies were mushy and the beef was too tough to cut. I returned the beef to the cooker and pressured for 40 more minutes. It was better but still not fork tender. Needless to say, the meal was a disaster. I followed the directions implicitly. Another problem, how do you get the liner separated from the lid in order to wash and clean it? How does it come apart? It is better to cook the veggies and meat separately to avoid the veggies from going mushy. Which roast cut were used? The best cut for pressure cooking is a well marbled chuck roast. Here is our Pot Roast recipe if you are interested. As for the liner (I assume it is the Silicone Rings), you can carefully pull it out from the lid to wash it. thank you for your question. Is it a pork shoulder cut? bone-in pork loin is quite lean and would be more suitable in a low temperature oven. 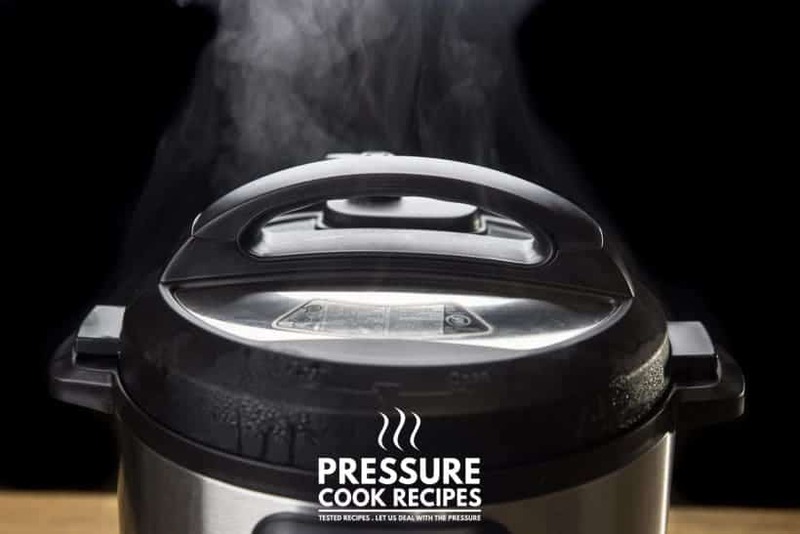 Using a pressure cooker will cause the outer layer of the meat to overcook and become tough. If you would like to use it in the Instant Pot, I would recommend cutting the pork loin roast into chops to cook it as pork chops. Here are some pork chop recipes for you. I received a Farberware pressure cooker. The recipes I’ve seen on Pinterest say things like, “set at 350 pressure”. I must be stupid, because I don’t know what button to push on my pot. Is there a conversion table for this? I’m obviously new, but I did cook a fabulous pot roast with a Farberware pamphlet that came with the pot, there are just not enough recipes from Farberware to match my pot. Is there a big Farberware pressure cooker cookbook? You can actually use Instant Pot recipes without any conversions as their cooking temperature are very similar. Just use the pressure cook button to cook at high pressure. Hello. I just purchased an 8 Qt electric pc and am seeing all/most recipes are for 6 Qt pc’s. Have I made a fatal mistake? Should I return it and get a 6 Qt? Thank you for your advice. Most of the recipes (if not all) can be used in an 8 quarts electric pressure cooker and you have extra space if you plan to double a recipe~! The heating plate in my pressure cooker has turned brown. It was gray and clean but for some reason there looks like it getting burnt on residue. I try using a magic eraser but that didn’t work. Have you got a different cleaning solution? Please let us know if you find a better solution!! I got an instant pot (5 qt) as a gift. I’m happy with the size but all the recipes and all accessories and questions are related to the 6 qt. Will that be a problem for me to find recipes for a 5qt and accessories for a 5 qt? For Jacket potatoes, you will have to place them in the oven to crisp up the skin afterward. Save way to clean the pot after putting chicken into it without the inner part? Some burnt chicken stuck to it. What do I clean itcwith? Uh oh, it sounds like Kaire is saying they put chicken inside the pot *without the liner* and there’s some mess on the inside of the pot, not the liner (in other words, it’s stuck in the part where food isn’t supposed to go)… you can’t really put water in that part, can you? Yes I must have misread the question. Please unplug the Instant Pot and try to use a slightly damped magic eraser to see if the burnt spot can be removed. Hi! I got my Instant Pot for Christmas and am just starting to use it the last 2 days. So far I’ve made white Jasmine rice, baked potatoes and applesauce, all turned out great! But this morning I tried black beans following a recipe I found online and beans weren’t cooked when finished. Set it on manual for 25 minutes with 16 oz beans and 7 cups water, bay leaves and garlic. Used the 10 minute natural release. Can I continue cooking them even though beans and liquid are very hot? Thank you! Black beans take about 40 – 45 minutes + Natural release. I ‘ve just gotten my IP & want to use up frozen left-overs. I don’t see any tips on how to cook/how much time it would take to fix frozen left-overs. Some leftovers will require a different method. What kind of frozen left-over are you planning to cook? Any idea where one can buy an electric pressure cooker for canning fruits and veggies? I am not aware of one that can stay constantly at 240F to do pressure canning yet. A pressure canner will be a better choice at this moment. My brother forgot to put the liner in the pot and pit in dried beans and water.,got the. Beans out but know the bottom is damp- suggestions? The best way is to dry it out with a towel and turn it upside down. Let it air dry for 24 hours before turning it back on. Don’t try to turn it back on in a hurry, because any moisture will short the circuit. 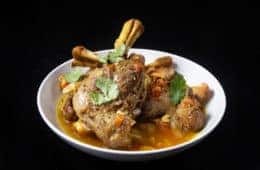 How do you get the cooker to go either low or high for slow cooking when using it as a slow cooker. I tried the adjusting button, but it would not move? I was able to adjust by pressing the Slow Cook button first, then press the Adjust button. I have tried so many dishes in this machine. Have decided it is not worth the effort. How do I return it to Amazon. I have had to go to users for help. No help from manuals. I received the machine Dec. 27 2016. Sorry to hear that. You will have to contact the amazon customer support at amazon.com. I have removed your address & email in the comment to protect you privacy. 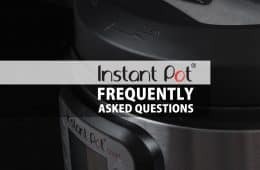 We are not a part of the Instant Pot company, but If you change your mind, we are happy to answer any of your questions. Just got my pot used it once worked great. Second time did something stupid, let the hot lid rest on a mixing bowl that was handy and the bowl was the exact size to fit on the sealing ring. Now the medal bowl is stuck on the lid (probaly one in a million case) but can’t get it off. Any suggestions? Yes, must be a one in a million case! I would try to expand the sealing ring by running it under hot tap water to see if the bowl will come lose. You can also try pouring some olive oil. If not, you can try to take out the mixing bowl with some force. The sealing ring should come loose. Make sure the sealing ring will seal properly after this as you may have to purchase a new sealing ring if it is cracked. Just got my Insta Pressure Cooker. I tried steel cut oats this morning. It said to cook using manual for 4 minutes. I set timer but after pre heating I started timing it on the clock and it was going way beyond 4 minutes. At 2 minutes left I turned it off. the oatmeal was totally done. Is this a malfunction of the machine or me. thanks for any advice. Once the LED indicator switches from ON to 4 minutes, it should only take 4 minutes timing. If it is taking a lot longer than that, I would suggest to contact customer support to let them know. Try it one more time to make sure! My problem is how to correlate thetime for a slow cooker recipe and convert it to a PC recipe. Is there some sort of formula? I also wonder can you pc with only fat or a small amount of oil or does one need to have more fluid ie stock,water or other liquid? How do I use a steamer basket in a pc? how to correlate thetime for a slow cooker recipe and convert it to a PC recipe. Is there some sort of formula? There is no exact formula for converting a slow cooker recipe. With that said, most chicken dishes will finish in under 20 minutes in the pressure cooker. I also wonder can you pc with only fat or a small amount of oil or does one need to have more fluid ie stock,water or other liquid? Oil or fat does not generate enough steam to get the PC up to pressure. Water or stock is needed. It is recommended not to use more than 1/4 cup of oil or fat in the pressure cooker. How do I use a steamer basket in a pc? I just got an IP. After I set IP to cook rice or pressure cook lentils, steam veggies etc, after it is done, once the natural release is completed, it goes to the warm cycle. Question: will the food cake if left in the warm cycle? If it does, is it possible to set the the warm cycle not to come on? Rice will cake if it is left in the IP for too long due to the material of the inner pot and the heating temperature. I don’t think it is possible to set the warm cycle function to come on, but even without the keep warm function, I think rice will still harden and cake due to the material of the inner pot and the temperature. In my opinion, a rice cooker does a much better job at keeping rice hot after the cooking cycle.